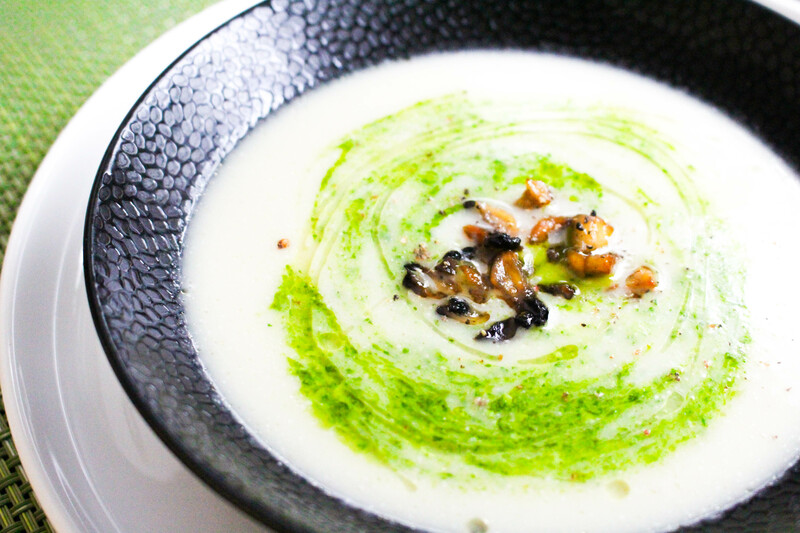 This soup is a perfect starter for a winter dinner party. All components can be made ahead so it’s just a matter of assembling the soup as your guests sit down to eat. Pistou is a French sauce similar to pesto but without the Parmesan, making this a great sauce for vegans. In this recipe I use rocket and almonds in my pistou, giving it a lighter flavour. You can skip passing the soup through a sieve if you like but I find the consistency is much finer if you do. The strained celeriac can then be used with mashed potatoes or can be frozen to use in a vegetable soup another time. Heat some olive oil in a large pot then add the onion, fennel, whole garlic cloves and celeriac with a level teaspoon of salt. Cook gently for about twenty to thirty minutes, until the vegetables soften. Add the bay leaves, thyme and the stock cubes. Pour enough boiling water into the pot to cover the vegetables then simmer for around half an hour. While the soup in simmering, using a food processor blitz all of the ingredients for the rocket pistou. Check the seasoning then set aside. Finely chop the mushrooms then heat a large frying pan over a high heat. Add some olive oil and the chopped mushrooms and cook on a high heat with some and salt and pepper. Once the mushrooms are crispy and well caramelised remove the pan from the heat and stir in the grated garlic. Once the vegetables have cooked remove the soup from the heat, add the cannellini beans and using a stick blender, blitz the soup. Take a sieve and pass the soup through the sieve one ladleful at a time (you can skip this step if you like). Return the soup to the heat, add some pepper then check the seasoning. To assemble the soup, ladle it into warm bowls then add the pistou in small dollops. Take a small sharp knife and stir the pistou around the bowl in a circular fashion. This will create those beautiful swirls and give the soup its contrasting colour. Spoon some garlic mushrooms in the center of the pistou swirl then add a some freshly cracked black pepper to serve.